I came home last night ready to jump right in and prime to my heart’s content. But let’s not forget that my schedule is chaos right now, and before I knew it, the clock is displaying 11 pm* and not a single swipe of paint had touched the upper cabinets. BAM. Even with really bad camera phone pictures, I am happy. 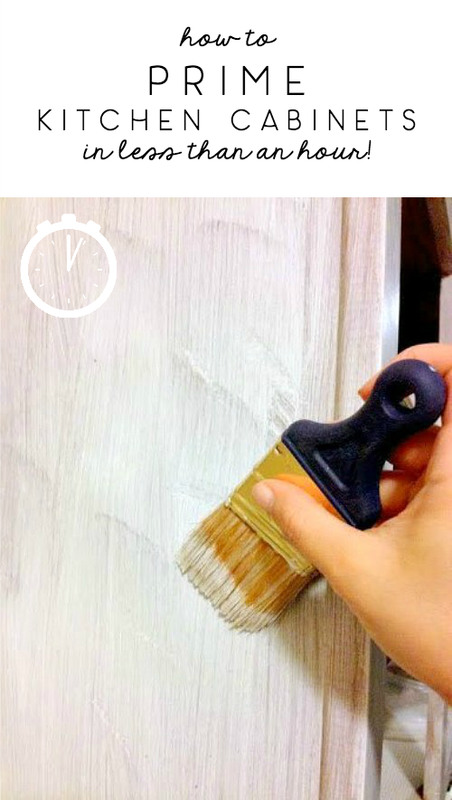 The trick to priming your kitchen cabinets in less than an hour? Well, the majority of it is ego. No concern for getting paint on my hands. Just humming the Wonder Woman theme song and telling myself I’m a paint ninja. There isn’t a stray drop on the floor and my appliances are all paint-free. See? Pure hubris. But with the right tools, the job was done in no time. I also use one and only ONE specific paint brush for the job. This Wooster shortcut angled sash brush has a short rubber handle, fits nicely in my small hands (insert “that’s what she said” joke), and is excellent for creating precise paint lines. Unlike the primer, it IS available at the big box stores (Home Depot is where I grab mine). With a little practice, I’m pretty sure anyone can learn to paint like a pro thanks to this brush. I also have a tutorial here if you want to check out more of my technique. I had already used a liquid sander/deglosser to avoid having to sand the cabinets, so all of the cabinets were ready for primer. As for how I ensure a smooth surface, the trick is basically to brush the paint on as fast as I can, and while it’s still wet, roll over it a couple of times with a dry foam paint roller to smooth out the brush strokes. Using the word dry again for emphasis. Primer doesn’t need to be thick to do the trick! In just a short while, the cabinets were not only primed, but dry to the touch. And then, I cheated – I couldn’t wait the full cure time to see if I liked the paint (I’d picked it out from a swatch, but I’ve read some great reviews of Benjamin Moore’s Decorator’s White from expert designers, so I figured they would be a reliable source). The lighting at night isn’t great in my kitchen, but I could tell I had a winner (I swear, it doesn’t glow or look bluish like this in person). I took a step back to get all 3 colors in the same shot: the upper cabinets (white), the lower cabinets (dark gray), and the old oak that will forever be forgotten about from this point forward. That already means I won’t get everything I really want done before my aunt and uncle come to town, but it DOES mean I’m getting the essential pieces of the cabinets finished in time. Half-ninja achieved. I love that attitude. “Pure hubris.” haha. That white looks great. Should be a sharp looking kitchen when you’re done. Is that a magnet you have holding your knives? I’ve never seen that before. Yep, purchased at Ikea, actually. It makes cooking a smidge more efficient. Where do you get those little yellow risers that you’re using to paint the doors? They are called “paint pyramids” on the packaging and I snagged several packages at Lowes. They only come 10 to a pack (which I think is weird, since the logical choice would be in multiples of 4 for each corner!). Beautiful white! “Pure hubris” is sometimes all that gets us through! I think the kitchen is going to be stunning! Haha yeah – they must be the same guys who came up with the hotdog/hotdog bun thing. I can’t wait to see how everything turns out! I’m almost finished with our kitchen and surprisingly we have similar colors…and butcher block…and subway tile! Great minds! Love the new look at Southern Hospitality! I’m now convinced you should do a “day in the life of sarah” post. I have no clue how you do it all! I’m coming up with a Time Tips series post soon about email and blog stuff though. Do you have a trick or advice on cleaning your paint brushes? Whenever I splurge on an expensive brush, it seems like I can only use it once or twice before the bristles are all gummed up and I always rinse really really well after using! Have you tried vinegar? I will sometimes soak the end to help break down latex paint if it’s gone overboard (but not so deep to tarnish the metal part). But I also don’t typically rinse out a brush until I’m done using the color (I put it in a plastic baggie and tape it so no air can get in). Hope that helps! Vinegar! I will try that! I should have thought of that, vinegar fixes everything! You know I had a big cackle when you said you were humming the Wonder Woman theme song. Did you see the comment I posted yesterday? And “that’s where I grab mine” may be a contender for –insert “That’s what she said.” I live with a boy in a man’s body….ugh. And after all that priming you HAVE to put up the color! Off to check out Rhoda’s site! You are aahhh…mazing! Great work. And thanks for the entertaining article! Woohoo! One hour priming is the way to do it! Love the tip about brushing it on and then rolling over it… I’ll have to remember that when I tackle *my* awful orange oak kitchen cabinets! That mere fact that you got it all painted in less then an hour is awesome. Looking forward to seeing it all done. Ah! You rock, girl! I’m totally referencing this post for future painting inspiration. I recently bought a house with a lot of…. Potential…. And every square foot (all 3000 of them 0_0) needs to be painted. But with a baby and a full time job, time is hard to come by. Thanks for the information and inspiration! It looks so good so far! Love the contrasting colors. What’s the plan for the counters? WOW get ’em! I admire you’re drive because my DIY projects typically take a looooonnnnggg time. I need naps in between LOL. Amazing house, thoroughly impressed by your work! Does this primer cover the grain in oak? I am still painting the top cabinets white, but I don’t see much bleed-through of the grain after a second coat of paint over the primer, and I think it will be completely gone by the third. It doesn’t get rid of the texture, of course. Hope that helps! Your posts are so fun to read. The Smart Prime is an excellent suggestion for DIYers! I have a few questions since I am considering doing the same project. 1. How are your painted cabinets holding up since you painted them? 2. And another question: you didn’t put a top coat over the colored paint to seal the paint and or protect it from scratches and washing fingerprints or stains? Did the BM paint hold up to washing? (didn’t say what finish paint you used, glossy)? 3. You mentioned using liquid sander on the cabinet doors before priming. What is that, please, explain? 1. They are holding up great! It’s normal to find a scratch or two with normal wear and tear for painted cabinets, but it’s definitely holding up better than I expected. 2. The BM paint is formulated so that it wasn’t supposed to have a top coat, and the reviews I read before attempting this didn’t indicate I needed one either. You can find more about the prep, priming the doors, materials used, and painting from several more posts. Prep work, including info about the liquid sander, is here. Prime is here and here. The first coat info is here. 3. See above on the prep post I linked to. I hope that helps! Thanks for responding and sharing all the details of your hard work. My kitchen is very similar to yours. However, i see one big glitch in attempting to do the same. My double wind-out Anderson casement window above the kitchen sink has thick grooved trim all around and right to each side of the cabinets. They are super glossy framed. That will be a nightmare trying to de-gloss the grooved trim, window ledge and framing. That would be the hardest part if possible to do. In addition would have to sit on counter and sink area to reach up to that window. I also have old black iron looking handles on each cabinet with a bumpy pattern to them so they would have to be replaced (they are gross). At one point I was considering buying trim molding to attach to the fronts of the cabinets to make them look more expensive or nicer. Ikea kitchen cabinets are starting to look pretty good to me…LOL. But I would still keep the old ones and re-purpose them to use in the basement for work space and storage. Did you ever attach handles or nobs to your redone cabinets.? I didn’t see that under your house tour, kitchen tabs with the finished picture??? Great job, what an undertaking. Thank you! So glad you like the way it looks. I bought hardware but hadn’t installed it yet. Just one of those “dangling” projects that never seems to take a high priority on the to-do list. I’ve got a few other projects going on for the kitchen right now, so hopefully one of these days I’ll just get frustrated and install them. I not only found this informative but I seriously LOL’d several times :D I love your writing! My fiancé and I are moving into a house with (I kid you not) the most hideous kitchen on the face of this planet (not so mellow-yellow countertops and mint green cabinets) until we save up for a full renovation (which may be never given our student loans and now a house lol) I was looking for simple and affordable ways to change my kitchen into an area where I actual want to eat and not well, “get sick.” that’s when I stumbled upon this article and the other one where you painted your countertops. Great info with just enough sass and humor to keep me reading. :) totally love it! Thank you. Glad you enjoyed it, Sarah! Always nice to hear that kind of feedback. Super dumb question – if your primer can go on any finish, why do you need to use a deglosser? Housemates and I want to do something with our hideous kitchen cabinets, but painting is probably the only think we are capable of. Want to spend as little as possible. Not a dumb question! But a deglosser is not going to set you back enough where it should be a budget concern. Primers might say on the can that it sticks to gloss (which is a tough thing to do without peeling later), but it is supposed to stick to a CLEAN surface. So with the way cabinets get used, over time, grime, finger oils, etc contribute to a less than ideal priming surface. And while primers can be formulated to stick to glossy material, in my experience, it is always better to sand and rough up the surface a little so that the primer has something to stick to. A deglosser helps me to AVOID the more arduous task of sanding in favor of an easier job (just scribbing). I hope that helps! Can you go into more detail on the dry foam roller thing? I’ve been trying to picture this. But it’s not making much sense in my head.